At North Olmsted Collision, we know what it means to bring your car back to showroom condition. We take the time to understand your concerns and provide custom solutions throughout the entire repair process. Our highly skilled technicians are trained to repair all makes and models. Our true passion and expertise are in meeting or exceeding customer expectations. We also have excellent relationships with all the major insurance companies and can assist in the insurance claim process from start to finish. Call us before you call your insurance company. Whether you’ve had a minor fender-bender or a major accident, you can rest assured your vehicle will be handled by the best the industry has to offer. 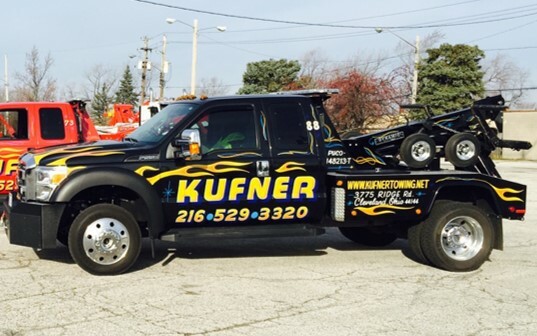 Call Kufner Towing at (216) 529-3320 to arrange a tow after hours. Our factory trained and certified auto body technicians will restore your vehicle to manufacture specifications, preserving the value of your vehicle. Call us at (440) 734-1700 to talk about your insurance claim. North Olmsted Collision was founded in 1991 by Patrick Kovalchuk and has since become a trusted name in auto body repair in Northeast Ohio. Pat’s passion for complete customer satisfaction and expert collision repair has translated into a thriving business where he and his production team, including Keith Rice, William Barrett, and Matt Akin, oversee each repair phase from beginning to end. This business approach has resulted in a customer base that is confident in the service and repairs they receive at North Olmsted Collision. Once you use North Olmsted Collision for your auto body and accident repair, you won’t want to go anywhere else.